John Adams was believed by some to be a traitor for defending the British officer, eight soldiers, and four civilians being tried for the “massacre.” John Adams and others believed that there needed to be a fair trial, which they received and were acquitted. John Adams did not go to prison for his belief in the importance of a fair trail and his choice to defend those thought to be our enemies. Lynne Stewart is the John Adams of our time and should not be in prison for defending those, who are believed to be our enemies. 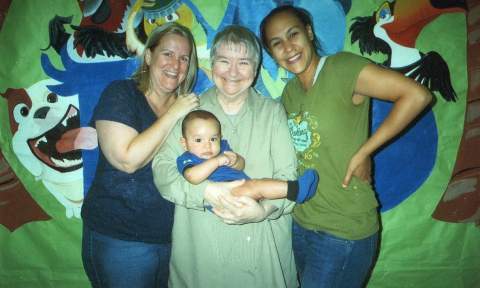 Lynne Stewart has been a federal prisoner since November 19, 2009. In the American justice system, even when a prisoner is not sentenced to be executed, the bureaucrats of the U.S. Justice Department’s Federal Bureau of Prisons still have extra-judicial ways of making sure a politically-targeted prisoner will die in jail. That is what Washington attorney Kenney wrote, without apparent irony, to Ralph Poynter, whose wife is incarcerated at the Carswell Federal Medical Center at the Naval Air Station in Fort Worth, Texas. Kenney’s letter countermanded the April 26 recommendation of the prison warden that Stewart be released. How Does A Washington Lawyer Practice Medicine in Texas? Badly. Lynne Stewart is 73, a mother, a grandmother, a great-grandmother, a librarian, and a lawyer (disbarred by her conviction). She has spent most of her 32-year professional life representing clients who might otherwise have been unprotected from the justice system. She has had cancer for several years. It has metastasized. The United States case against her is also a cancer, and it too, metastasized. In the 1990s she represented Omar Abdel-Rahman, also known as “the blind sheikh,” in his defense against terrorist conspiracy charges. Rahman was convicted in 1995 and is now serving a life sentence. Stewart continued to represent him in appealing his conviction, but she agreed to follow “special administrative measures” imposed by the Justice Dept. These measures are bureaucratically imposed conditions that, among other things, allowed the government to monitor Stewart and her client without regard to attorney-client privilege. Stewart acknowledges she sometimes violated these special administrative measures, but the Clinton administration chose not to bring charges against her for those violations. In its deep panic of overreaction to 9/11, the Bush administration first indicted Stewart in 2003. Those charges were dismissed. Lynne Stewart has been a federal prisoner since November 19, 2009. She appealed again to the Second Circuit, which upheld her conviction and the re-sentencing that it had ordered. She has not appealed to the U.S. Supreme Court. “Lynne Stewart, in the vindictive and hysterical world of the war on terror, is one of its martyrs. A 73-year-old lawyer who spent her life defending the poor, the marginalized and the despised, including blind cleric Sheik Omar Abdel Rahman, she fell afoul of the state apparatus because she dared to demand justice rather than acquiesce to state sponsored witch hunts. In November 2010, Human Rights Watch publish a report, taking the U.S. to rask for how seldom it grants any prisoner a compassionate release. Stewart asked for one anyway. The Bureau of Prisons showed her no compassion. Officially, and without credible explanation, the United States has expressed its preference to see a political prisoner suffer and die in prison, all because she didn’t take the government’s special administrative measures seriously enough. This is the government we have now, with an opposition party howling for it to be more horrible still. There was a time when it was thought that justice should be done, and justice should be seen to be done. Now it’s apparently good enough that what the government alleges to be justice just be seen to be done harshly. We’re Americans, we don’t do compassion. Is there an American Voice Any More? And Whose Is It? This is not the way attorney Kenney would put it, surely. And it’s not the way Attorney General Eric Holder would put it, or President Obama. But Malkin’s voice is their voice their voice all the same, praising the things they do, in a voice turned up to high screech. “I know we are all disappointed to the marrow of our bones and the depths of our hearts by the news that the Bureaucrats, Kafka like, have turned down my request for compassionate release…. “The letter from [attorney Kenney] is flawed, to put it mildly. Both factually and medically it has major problems. We intend to go to court and raise these in front of my sentencing Judge Koeltl. At the first sentencing he responded to a query by one of the lawyers that he didn’t want me to die in prison — we’ll see if he can now live up to that…. Do you know who she is? Lynne Stewart, the John Adams of our Time ….. read about her here!!! A woman, a lawyer, a mother, a grandma …. human rights activist … in jail … with terminal cancer! The DOJ is “sitting on” a request for humanitarian release to Sloan Kettering Cancer Center …. Please, research & post out there!! Once upon a time I would have said “I can’t believe it” ….. “not true” … Now I’m sure this is happening!! GITMO comes to mind. What harm can she do if she is released?? Come on ….. sent her to the medical center for treatment. And wait …. she’s not a lawyer anymore. She can’t defend another enemy … so what is the problem???? SMH …..
Kafka would not have had the “stomach” to write the story of what the U.S. judicial system has done to Lynne Stewart. Thank you for bringing her story to our attention. The grave injustices coming down on more and more civil rights lawyers, journalists, whistleblowers, et al., are not once-in-our-lifetime incidents. It is becoming “the norm” not an anomaly. It is what our corporate-attuned government does when the “powerful” are questioned. Before it becomes a deluge, we the people, have to push back. I agree!! Main stream media has nothing on this person. I found out through the blogosphere! Agree … we need to PUSH!!! I’m pushing as hard as I can!! !